Although I love the relaxed, homework-free, casualness of summer, there are definitely a few downfalls to the kids being out of school. The constant bickering, the havoc wreaked on the house, the over-scheduled activity calendar and the appearance of dirty socks on every open surface all throughout the day, just to name a few. Needless to say, I'm always on the lookout for ways to save time (and my sanity), so that we can keep up with life (and possibly have enough time left over for me to shower). 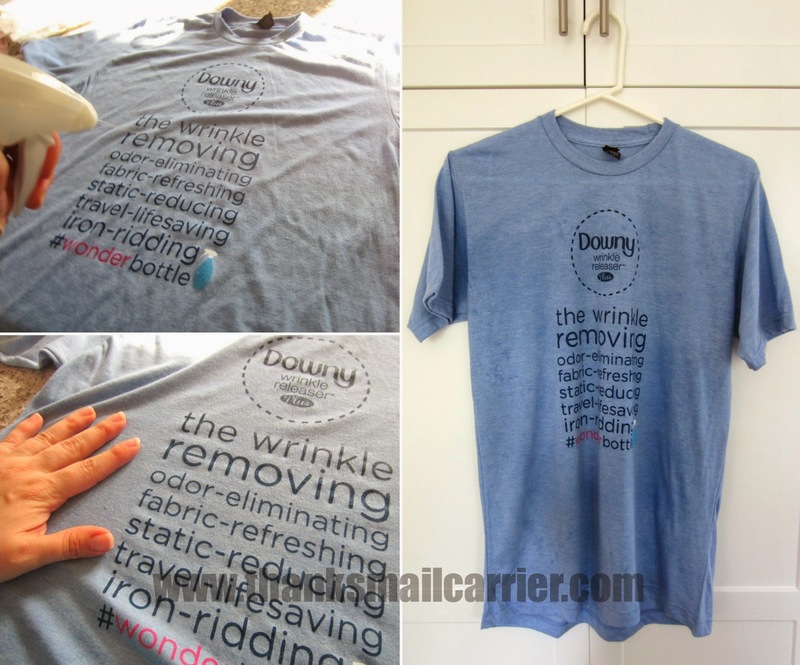 Most recently, I've been introduced to one product that not only follows through on its intended use, but manages to have 100 other convenient, helpful, time-saving quick-fixes as well: the new and improved Downy Wrinkle Releaser Plus. Designed to eliminate wrinkles by coating fabric fibers with silicone that allows them to relax and slide apart instead of being frozen in a crease, Downy Wrinkle Releaser Plus makes ironing a thing of the past. What parent has time to get out the ironing board, wait for the iron to heat up and then iron an outfit in the morning? Instead, simply point and spray Downy Wrinkle Releaser Plus, smooth and tug the garment, then allow fabric to dry for a crisp, fresh smelling and wrinkle-free look in minutes. Even better, after thorough research and testing, Downy has redesigned the spray trigger on their bottles so that it can perfectly deliver a finer mist of Downy Wrinkle Releaser Plus. The new and improved sprayer delivers broader coverage to reduce drying time, meaning releasing wrinkles from fabric is as easy as squeezing a trigger. Can it really be that simple? Now this I've got to see. 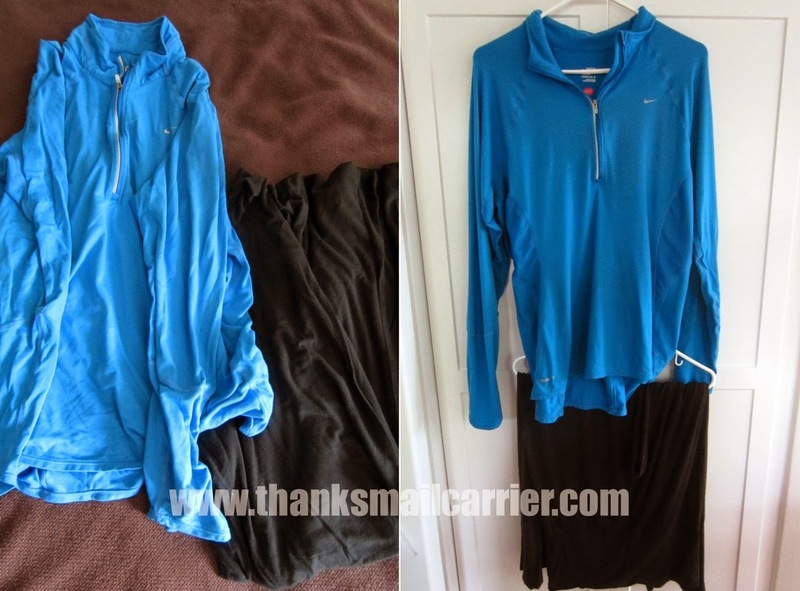 Three steps to wrinkle-free clothes? Even I can handle that! Tug to loosen wrinkles and then smooth to flatten. 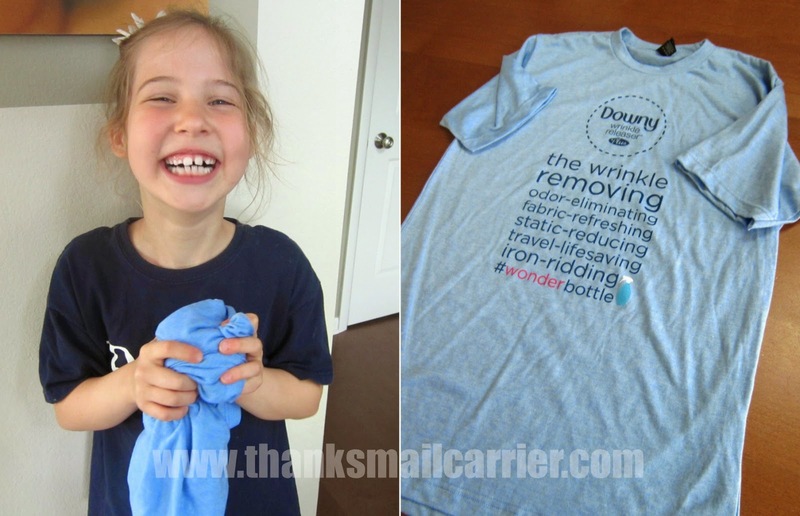 Downy sent along a wrinkled t-shirt as the test subject for their Wrinkle Releaser Plus, but, in an effort to make sure that it was indeed wrinkled, I let Big Sister E go ahead and mash, roll, crunch and play with it for a few minutes. The end result was thoroughly wrinkled, back and front. After spending a minute spraying and smoothing/tugging on both sides of the shirt, I hung it on a hanger and walked away to let it dry (Downy suggests 5-10 minutes), already noting that it looked noticeably less wrinkled. 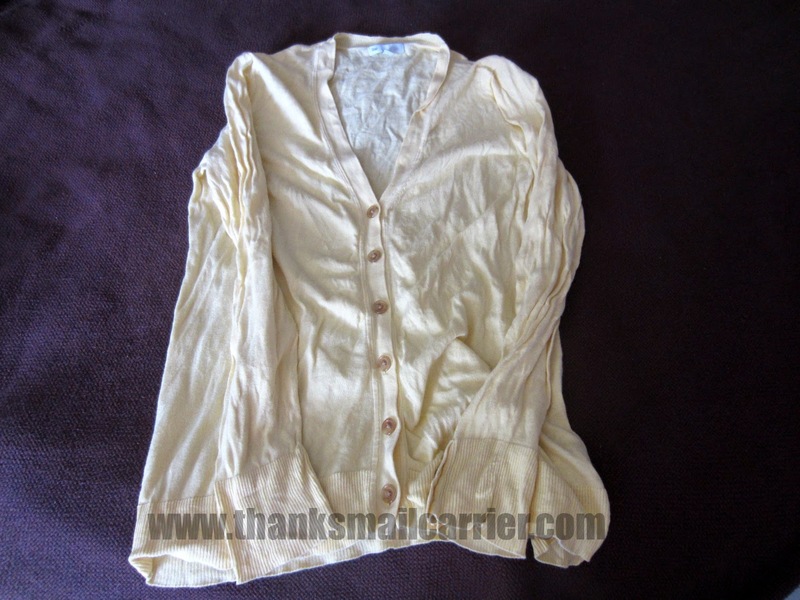 Unsurprisingly, when I returned to check on my dry shirt, it looked much less wrinkled than how it had started! But, okay. Maybe this was just an extra smooth shirt? Or designed to not hold wrinkles (does fabric like that exist)? 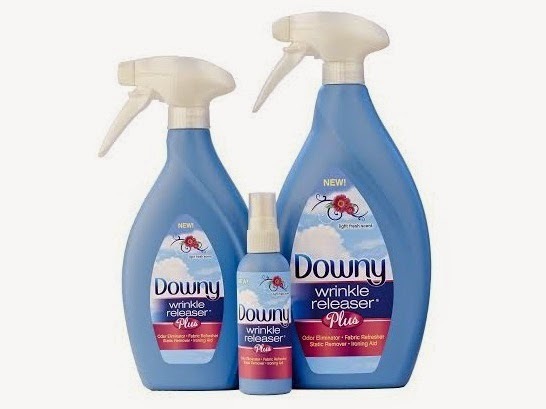 I needed to put Downy Wrinkle Releaser Plus to work on my own clothing, which are most often a wrinkly mess due to me leaving them in random piles around my bedroom. 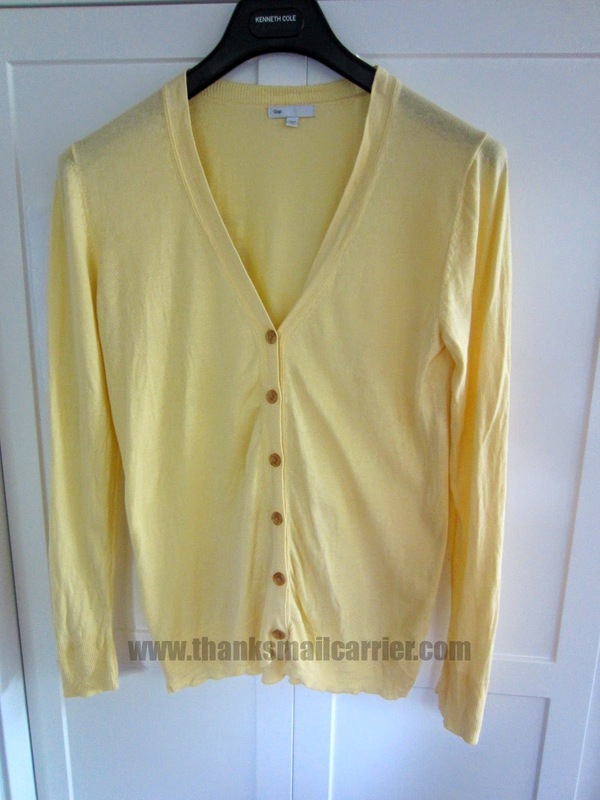 ...I've instead given it a spray with Downy Wrinkle Releaser Plus, tugged and smoothed it all over, placed it on a hanger while I take a shower, and it is ready to wear. I've found myself excitedly pointing out my head-to-toe outfit (typically yoga pants and an athletic top) to my friends and telling them how it started the morning as a wrinkled pile! Thanks, Downy! As well as my adoration of Downy Wrinkle Releaser Plus as a replacement for the hassle of ironing (and for making me not look like a slob), I've also come to realize why Downy has deemed it "The WonderBottle." There really is an endless number of uses for this great spray! 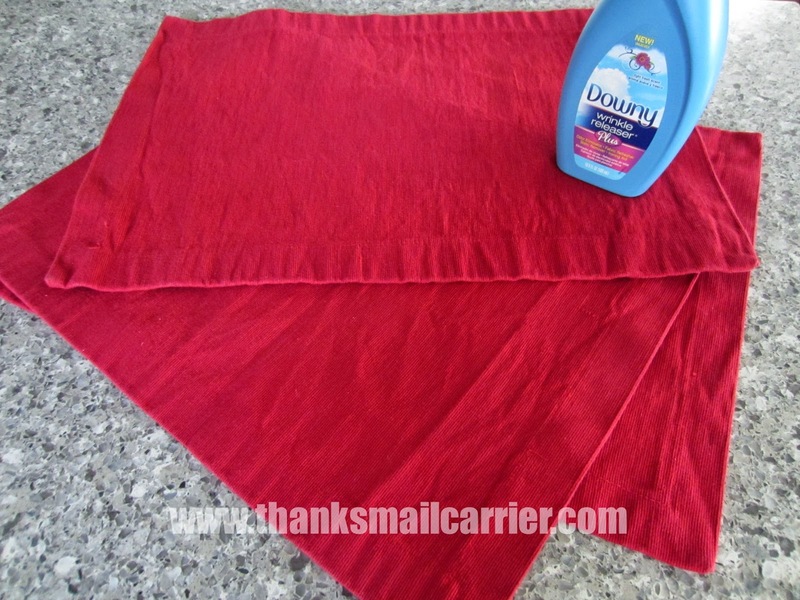 While traveling, pull one of the small bottles out to remove wrinkles from clothes that have been scrunched in a suitcase; at home, quickly remove creases from sheets and pillowcases, drapery, tablecloths, cloth napkins, and many other household items; at work, pull this out to remove static cling or wrinkles that appeared during transit; and more! As an added bonus, Downy Wrinkle Release Plus has a light, fresh scent that dissipates as it dries, so there is no worry of items ended up with an overpowering aroma or flowery smell. Instead, you get the double-win of a set of unwrinkled placemats that also are odor-free and fresh when your guests arrive! I was too excited about spraying these to remember to take a Before picture... but trust me that these were some very wrinkled placemats! No matter what your next fashion emergency, I highly recommend reaching for a WonderBottle of Downy Wrinkle Release Plus to save the day. Why waste time with an iron when you can just spray the wrinkles away? Keep an eye out for this innovative solution at Walmart, Target, Walgreens, Kroger, Publix and many other grocery, drug, and mass retailers, where a 1-liter bottle retails for $6.99 and a 500 mL bottle for $4.19. It is also available in a travel-friendly 3-ounce size for $1.99 (hint: print a $1 off coupon before you go)! 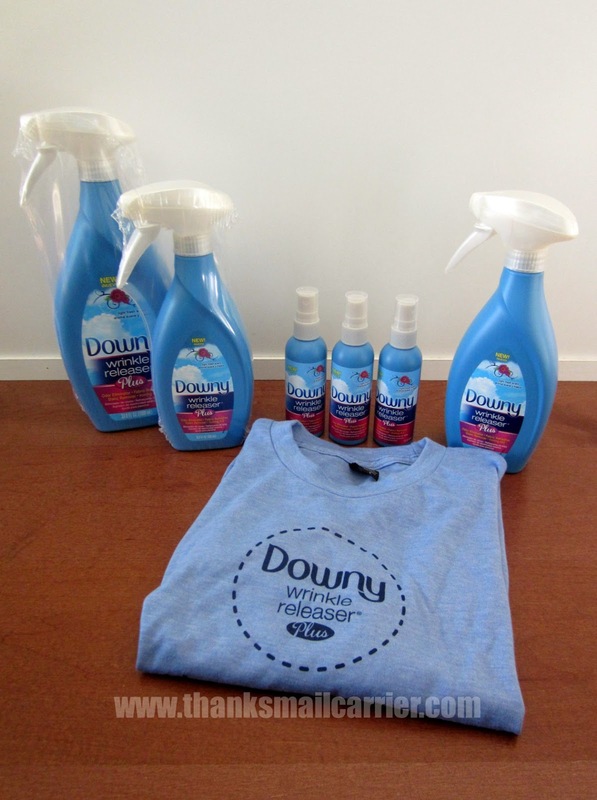 Other than the t-shirt and samples of Downy Wrinkle Releaser Plus I was provided by Downy in order to facilitate my review, I was not compensated or enticed to do this post in any way. This review is solely my honest opinion of this product. I need to get some of the Downy Wrinkle releaser because it looks like it really works, and I do not have a lot of time to always iron. Downy Wrinkle Relaxer has been one of my must-have products for years, but I haven't yet tried their new Plus formulation. Honestly, I love this stuff, and I can only imagine that I'll love it even more now. Thanks for your thorough but funny review. this looks like it works great. it it would be great for my tshirts. 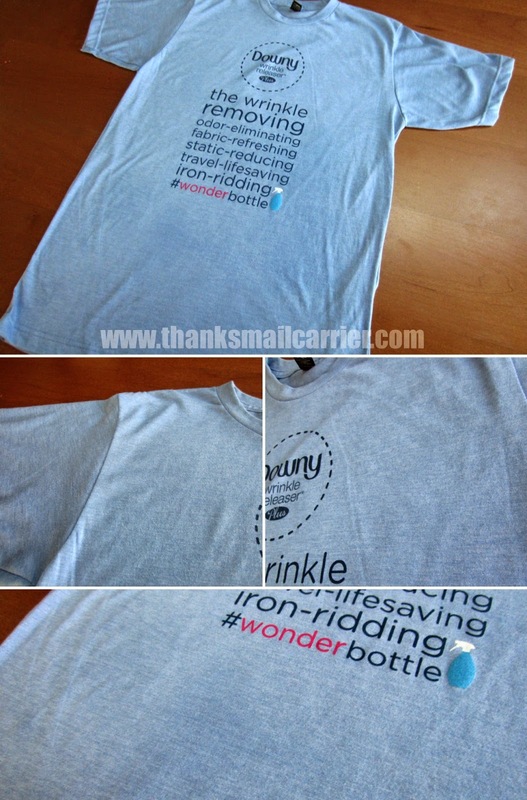 Wow, Downy Wrinkle Releaser looks Plus looks like it does great work, I have got to give it a try. Does it work on all fabrics? Such a great question, M Clark! Yes! Right on the bottle it says that this is safe for virtually all fabrics and suggests that if you are planning on using it on one that might leave water spots (e.g. silk) that you should try it in a small, unnoticeable location first. So far it hasn't failed me on a single thing I've tried it on! I love it!! I do own an iron, but it usually collects dust. I have several outfits that I don't wear because I don't have time to iron. Have to try this. Wow what a great product. Thank you for your review.